A private counseling practice offering services to individuals 14 and over. Mindfulness-based counseling to help restore calm, joy, peace, and hope into the lives of those experiencing mental illness, emotional suffering, and daily stressors. Have you been diagnosed with a mental health disorder? Are you struggling with the trials, stressors, and problems of daily life? Does it feel like your thoughts and emotions are controlling you? NOW is the time to take back control of your life! When life seems chaotic, confusing, and stormy we will guide and direct you to find peace, stability, and happiness. 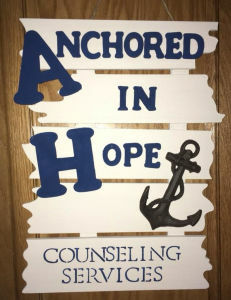 Anchored in Hope Counseling Services, LLC utilizes mindfulness based counseling techniques to provide you with guidance, support, and effective skills to manage your symptoms and concerns through all of life’s stressors. You will participate in a therapeutic alliance that will empower you with the ability to take control over your thoughts, feelings, actions and decisions. This ability will provide you with the opportunity to enjoy and find peace within the present moment, thrive in stability, and embrace the happiness that encompasses your life. Call today to schedule an initial evaluation and intake and begin this journey to wellness!